In the early twentieth century, our understanding of physics changed rapidly; now, our understanding of biology is undergoing a similar rapid change. Recent breakthroughs in biology are largely about information—understanding how organisms encode it, store, reproduce, transmit, and express it—mapping genomes, editing DNA sequences, mapping cell-signaling pathways. Changes in our understanding of physics, accompanied by rapid industrialization, led to profound cultural shifts—changes in our view of the world and our place in it. In this context, modernism arose. Similarly, recent changes in our understanding of biology are poised to create new industries and may bring profound cultural shifts—new changes in our view of the world and our place in it. Already we can see the process beginning. Where once we described computers as mechanical minds, increasingly we describe computer networks with more biological terms—bugs, viruses, attacks, communities, social capital, trust, identity. Over the last 30 years, the growing presence of electronic information technology has changed the context and practice of design. Changes in production tools designers use (software tools, computers, networks, digital displays and printers) have altered the pace of production and the nature of specifications. 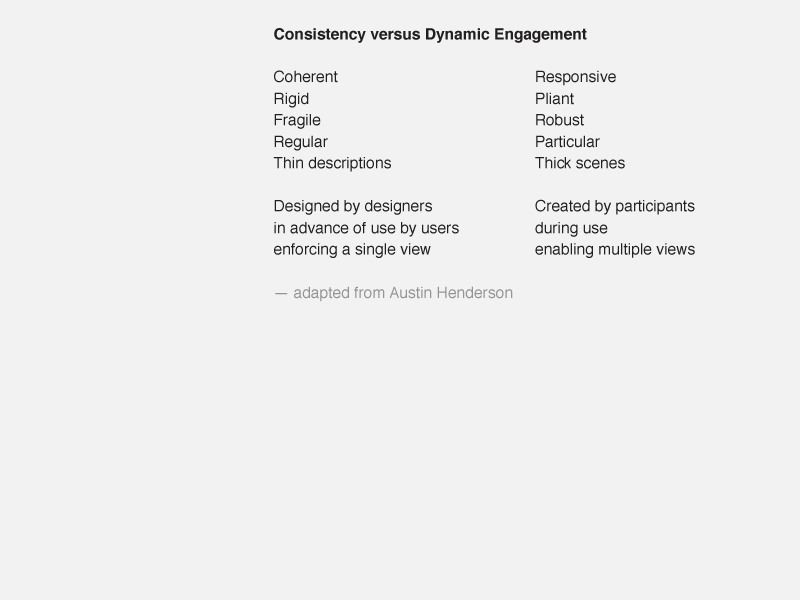 But production tools have not significantly changed the way designers think about practice. In a sense, graphic designer Paul Rand was correct when he said, “The computer is just another tool, like the pencil ,” suggesting the computer would not change the fundamental nature of design. But computer-as-production-tool is only half the story; the other half is computer-plus-network-as-media. Changes in the media designers use (the internet and related services) have altered what designers make and how their work is distributed and consumed. New media are changing significantly the way designers think about practice. New types of jobs have emerged. For many of us, both what we design and how we design are substantially different than they were a generation ago. What do electronic media and designing have to do with biology? Emerging design practice is largely information based—awash in the technologies of information processing and networking. Increasingly design shares with biology a focus on information flow, on networks of actors operating at many levels and exchanging the information needed to balance communities of systems. Modern design practice arose alongside the industrial revolution. Design has long been tied to manufacturing—to reproduction of objects in editions or “runs.” The cost of planning and preparation (the cost of design) was small compared to the cost of tooling, materials, manufacturing, and distribution. A mistake in design multiplied thousands of times in manufacturing is difficult and expensive to fix. The realities of manufacturing led to certain practices and in turn to a mindset or even a way of thinking. In the “modern” era, design practice adopted something of the point-of-view or even the philosophy of manufacturing—a mechanical-object ethos. Now as software and services have become a large part of the economy, manufacturing no longer dominates. The realities of producing software and services are very different than those of manufacturing products. Services also have a different nature than hardware products. 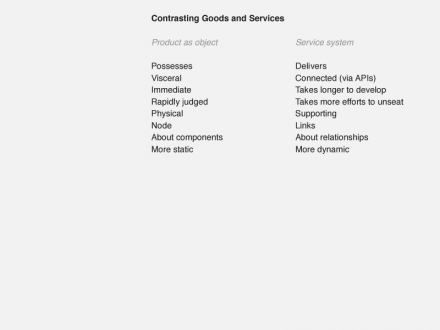 “Services are activities or events that create an experience through an interaction—a performance co-created at point-of-delivery .” Services are largely intangible, as much about process as final product. They are about a series of experiences across a range of related touch-points. The realties of software and service development lead to certain practices and to a mindset or even a way of thinking. 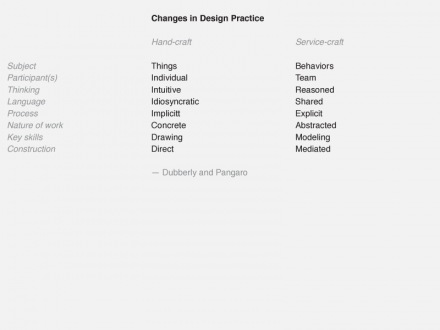 Emerging design practice is adopting something of the point-of-view or even the philosophy of software and service development—an organic-systems ethos. Several critics have commented on facets of the change from technical-object ethos to organic-systems ethos. This article brings together a series of models outlining the change and contrasting each ethos. The models are presented in the form of an “era analysis.” Two or more eras (e.g., existing-emerging eras or specified time periods) are presented as columns in a matrix with rows representing qualities or dimensions, which may change across each era, characterizing aspects of the era. The eras are framed as stark dichotomies to characterize the nature of changes. But experience is typically more fluid, lying along a continuum somewhere between extremes. 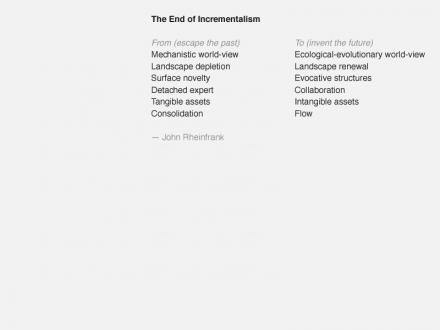 John Rheinfrank  provides a broad summary of the change, which may serve as an introduction and an overview. He begins by describing a change in world-view, similar to the change in ethos described above. 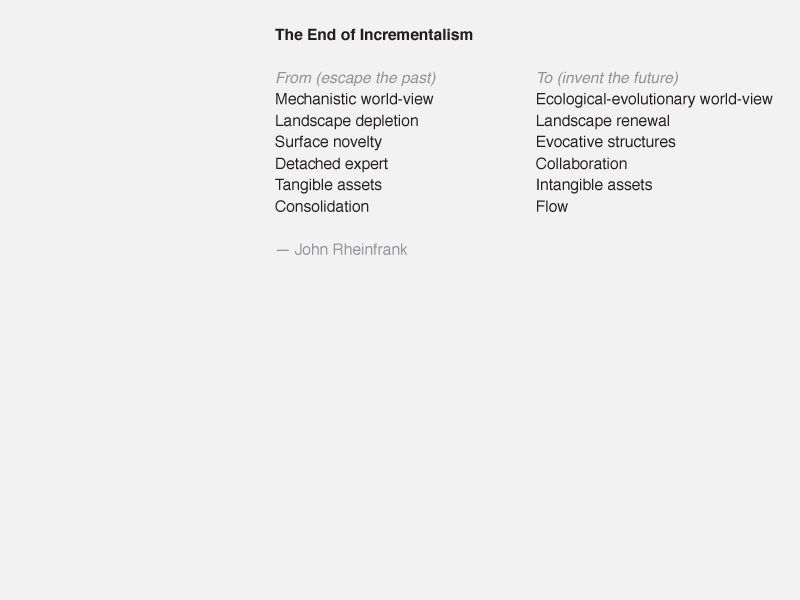 We may expand Rheinfrank’s model, to describe how things come to be and the role of designers and their clients in the process. At the heart of Henderson’s call for “Pliant Computing” is a deep concern for people who use computers. 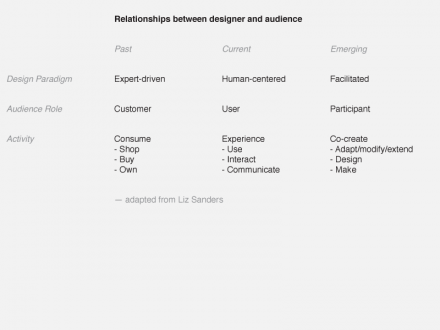 Henderson sees the relationship between designer and audience changing. 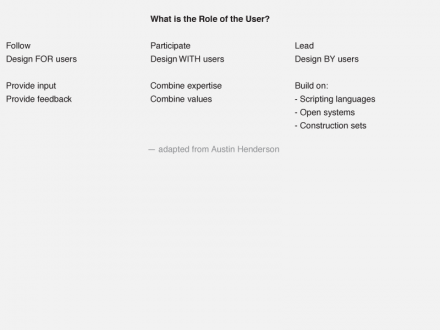 As Rheinfrank pointed out, the designer is moving from detached expert to collaborator. And the relationship between designer and constituent is moving from expert-patient to what Horst Rittel called, “a symmetry of ignorance (or expertise) ” where the views of all constituents are equally valid in defining project goals. 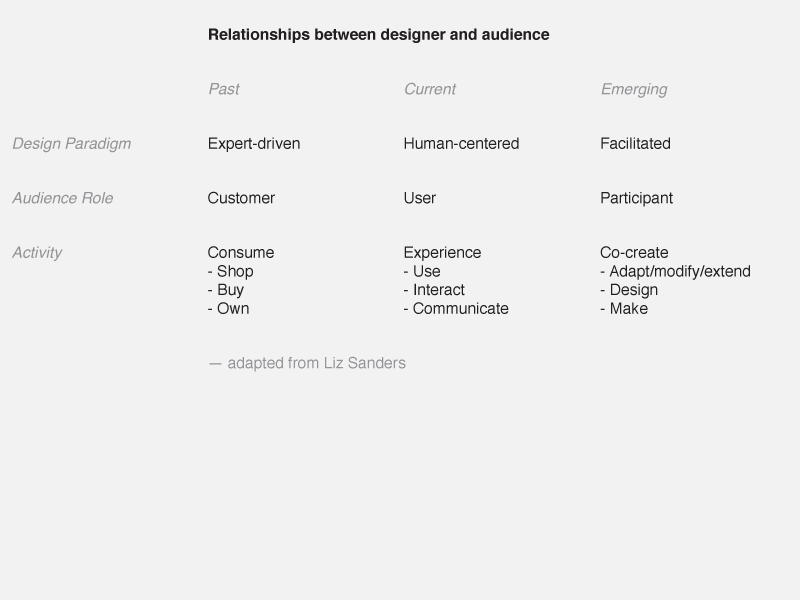 Liz Sanders  presents a similar argument with slightly different eras, explicitly introducing the idea of moving beyond human-centered or user-centered design. 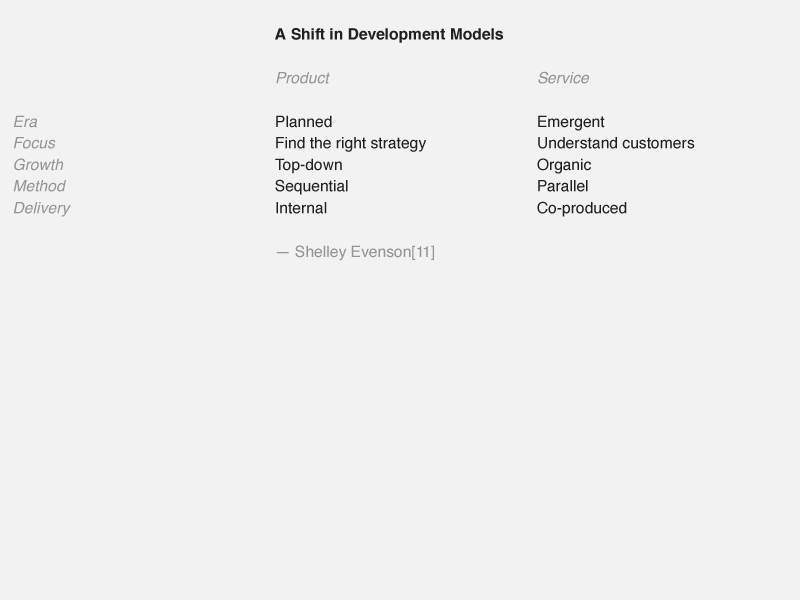 Early on, Shelley Evenson saw the importance of service design, and she has led U.S. designers in developing the field. 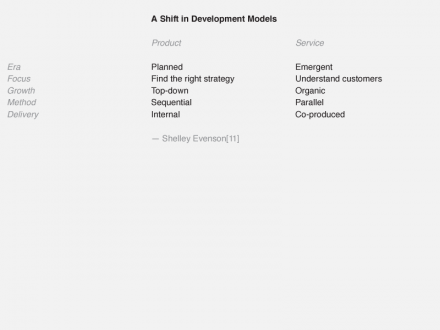 She has provided a framework contrasting traditional business-planning methods with service-design methods. Her framework parallels the larger change in ethos we’ve been discussing. Typically, responsibility for designing individual artifacts rests pretty much with one individual, but systems design almost by definition requires teams of people (often including many specialties of design). The need for teams of designers can be seen easily in the design of software systems and service systems, where many artifacts, touch-points, and sub-systems must be coordinated in a community of cooperating systems. For example, “web-based services” or “integrated systems of hardware, software, and networked applications” require development and management teams with many specialties. The work of an individual designer on an individual artifact has often been characterized as “hand-craft.” In contrast, Paul Pangaro and I have proposed “service-craft” to describe “the design, management, and ongoing development of service systems.” Design practice in a hand-craft context differs markedly from design practice in a service-craft context. Having assembled a team, care must be taken to negotiate goals, set expectations, define processes, and communicate project status and changes in direction. Care must also be taken to create opportunities for new language to emerge and to create capacity for co-evolution between service and participants. 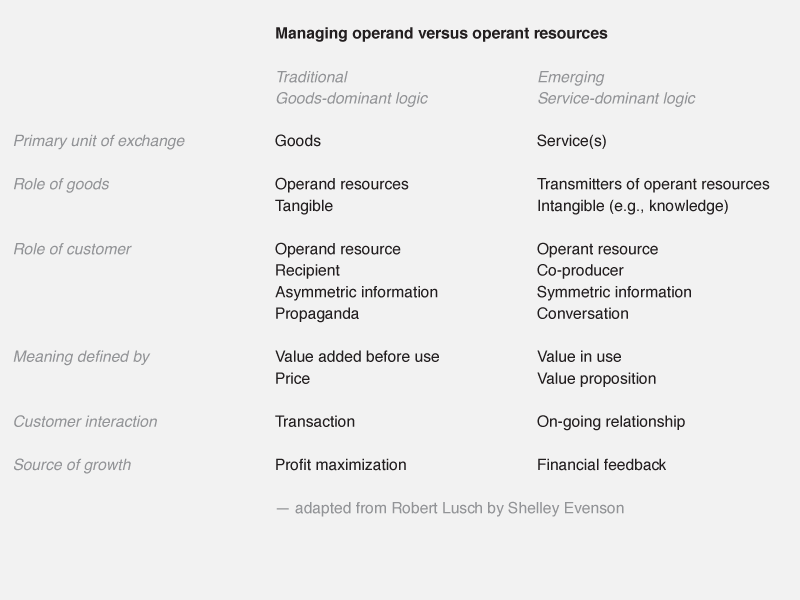 Robert Lusch  wrote about changes in marketing, describing a service-dominant logic in which “value is defined by and co-created with the consumer rather than embedded in output.” The “make-and-sell” strategy of linear value chains gives way to the “sense-and-respond” strategy of self-reinforcing “value cycles.” Lusch described traditional goods-centered dominant logic as focused on “operand resources,” tangible assets with inherent value. 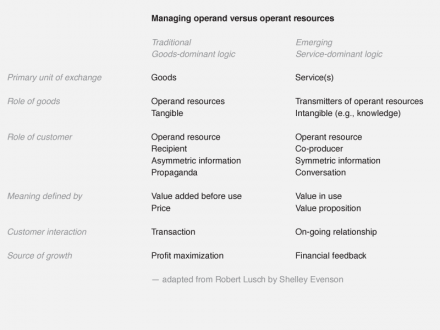 He contrasted that logic with emerging service-centered dominant logic focused on “operant resources,” intangible assets, which create value in their use, such as skills, technologies, and knowledge. He also pointed out that service logic is not only compatible with the idea of a learning organization, but it may actually require one. Nicholas Negroponte has famously contrasted “atoms and bits.” The physical, tangible, here-and-now aspect of products-as-objects makes them relatively easier to evaluate than services. This characteristic is one of the things that make products easier to manage than services. A CEO can pick up a product appearance model and immediately evaluate it, compare it to another, and decide how to proceed. Even a complex product like a car can be evaluated relatively quickly. But services are much harder to evaluate. Services cannot be apprehended all at once; they must be experienced over time. And sometimes service varies from one experience to the next. The mechanical-object–organic-system dichotomy also appears vividly in discussions about ecology. Much of our economy still depends on “consumers” buying products, which we eventually throw “away.” William McDonough and Michael Braungart have pointed out that there is no “away,” that in nature, “waste is food,” They urged us to think in terms of “cradle-to-cradle” cycles of materials use, and they suggested manufacturers lease products and reclaim them for reuse . Theirs is another important perspective on the idea of product-as-service. Architects, too, have begun to design for disassembly and reconfiguration. 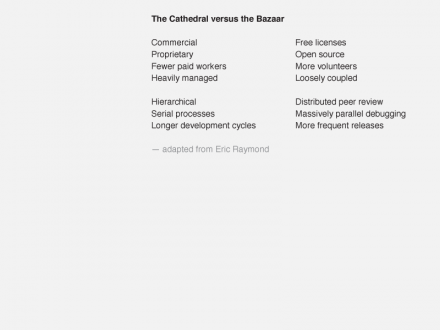 Herman-Miller recently published a manifesto on programmable environments, talking about the need for “pliancy” in the built environment and echoing the language The Cathedral and the Bazaar while discussing building design . Sustainable design is emerging as an issue of intense concern for designers, manufacturers, and the public. The same sort of systems thinking required for software and service design is also required for sustainable design. This provides further impetus for changing our approach to design education. The current shift from a mechanical-object ethos to an organic-systems ethos has been anticipated in earlier shifts. In the mid-1960s, architects and designers began to focus on “rational” design methods, borrowing from the successes of large military-engineering projects during the war and the years following it. While these methods were effective for military projects with clear objectives, they often proved unsuccessful in the face of social problems with complex and competing objectives. For example, methods suited to building missiles were applied to large-scale construction in urban redevelopment projects, but those methods proved unsuited to addressing the underlying social problems that redevelopment projects sought to cure. Horst Rittel  proposed a second-generation of design-methods, effectively reframing the movement, casting design as conversation about “wicked problems.” His proposal came too late or too early for the design world, which had already moved on to “post-modernism” but had not yet encountered the internet. Rittel’s work did attract attention in computer science (he was a pioneer in using computers in design planning), where “design rationale” (the process of tracking issues and arguments related to a project) continues as a field of research. More recently, Rittel’s work has attracted attention in business school publications addressing innovation and design management . Paul Pangaro and I have also noted that Rittel’s framing of first- and second-generation design methods parallels Heinz von Foerster’s framing of first- and second-order cybernetics. 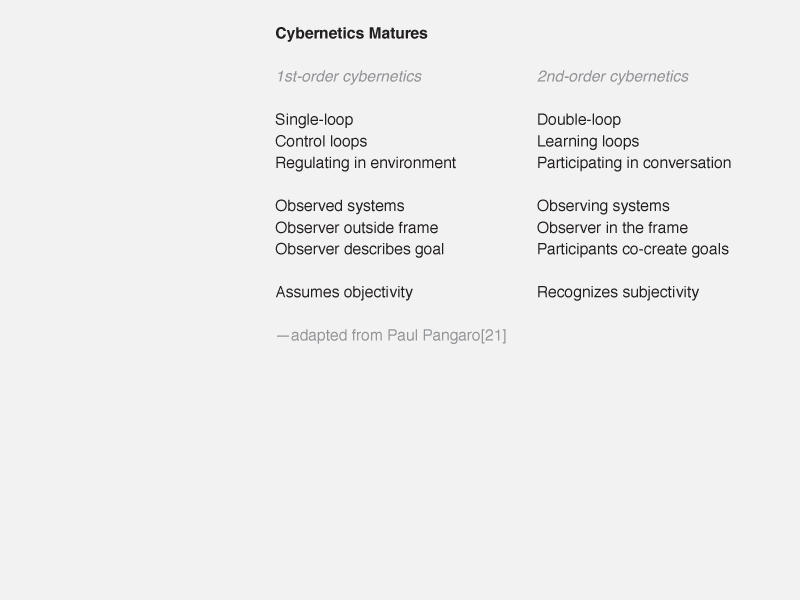 Von Foerster described a shift of focus in cybernetics from mechanism to language and from systems observed (from the outside) to systems-that-observe (observing-systems). In 1958, von Foerster formed the Biological Computer Laboratory at the University of Illinois Urbana-Champaign. He brought in Ross Ashby as a professor and later Gordon Pask and Humberto Maturana as visiting research professors. The lab focused on problems of self-organizing systems and provided an alternative to the more mechanistic approach of AI followed at MIT by Marvin Minsky and others . In a way, von Foerster anticipated the shift from mechanical-object ethos to organic-systems ethos in computing, design, and perhaps the larger culture. What do these changes mean for design education? Davis’ argument and framing are closely related to changes described in this article. 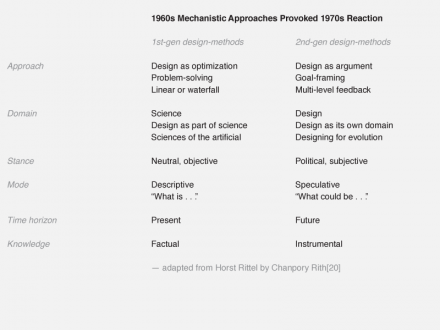 Changes Davis advocates are consistent with the spirit of the new ethos and aimed at helping designers grasp the nature of organic-systems work and preparing them for practice in the Age of Biology. Of course, not all designers welcome the coming change. 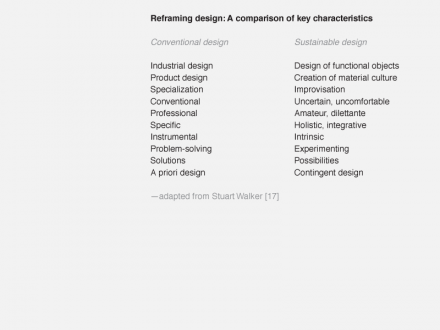 Form-giving remains a large part of design practice and design education. Will some designers be able to continue to practice primarily as form-givers? That seems likely. But already a schism is developing both in design practice and design education, as individuals and institutions choose to focus on either form-giving or on planning. It remains to be seen if one person, one firm, or one school can bridge the divide and excel at both. Fantastic lecture tonight at The Pozen Center for Interrelated Media as part of The Dynamic Media Institute’s Annual Lecture Series. Hugh, thank you for bringing this conversation to MassArt and for meeting up at DMI Headquarters to deepen the discussion and engage us all in the extended conversation. I especially appreciate the references you gave pertaining to ‘total design’. My own thesis topic for graduate studies at The Dynamic Media Institute pertains to ‘media translation’ … which for me includes discussion of translation versus interpretation, the occasional poetic impossibility to fully bring exact meaning from one mediaform to another, as well as Wagner’s concept of the Gesamtkunstwerk … and how the role of the designer becomes less and less about a particular medium or format and more that of a strategic visionmaker of environment, experience, culture, systems … basically a re-inventor of new language. Is there a new media equivalent to Esperanto? Or will we need to weed through babble to distill meaning from a multi-lingual onslaught of expression in this dawn of participatory dialectics? I just finished reading through the Systems and Complexity exercise that asked you all to hand in on Monday. (Still need these from a few of you!) From the responses, it seems that the interpretation of the assignment for many was to literally quote or paraphrase or extract very specific definitions by the writers of “complexity” and “systems” rather than interpret these as the larger ideas represented in the writing. By complexity I mean “not simple.” Like our lives today — so many things, considerations, concerns, and interests, all to be dealt with, managed, considered, consumed, as well as how one thing impacts another. Changes in technology and media are very particular examples. As designers, this is not only the reality in which our professional lives exist, but raises serious challenges and potential opportunities for our design work. How designers have dealt with complexity — whether ignoring or embracing — it underlies essential values that have, and continue, to impact design decisions. By systems I’m referring to all the mechanisms and tools for managing those complexities. 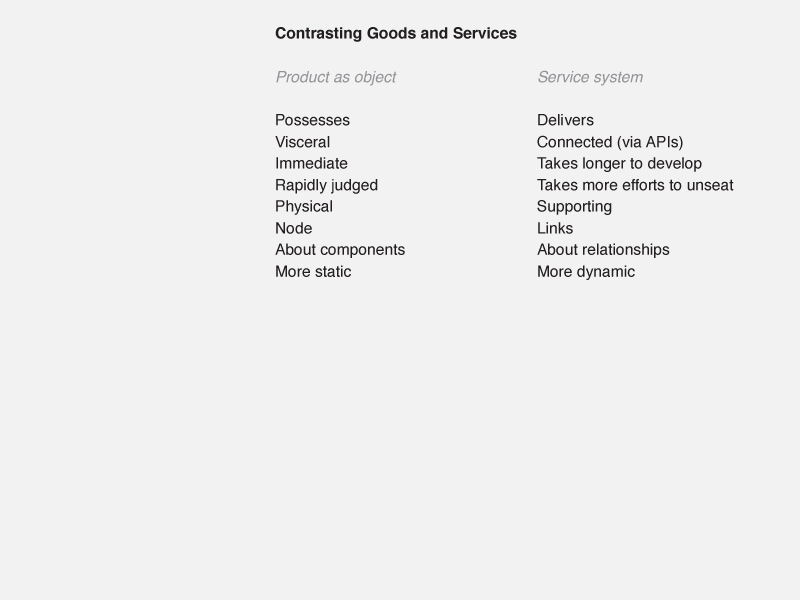 As Izzy, Ben, Thomas, and Nate pointed out everything in design is a system. Grids, typography, and typefaces — all of which are the fundament elements of graphic design ARE systems. And most importantly, for language to be a language, it must be a system. 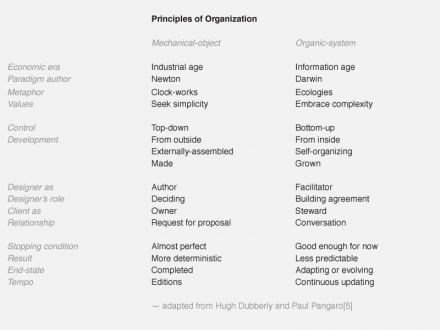 Discussion of complexity and systems are thus fundamental to any discussion of design. 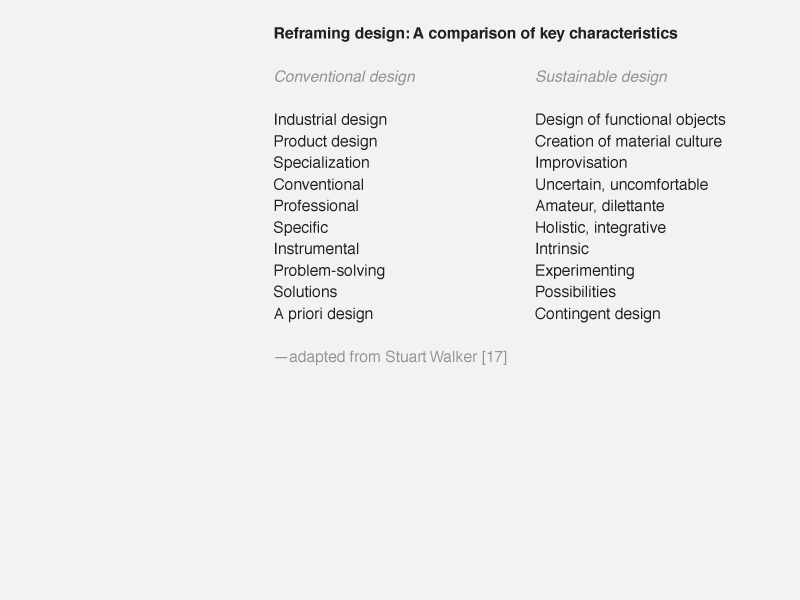 Seeing how discussion of the significance and meaning of these two concepts has evolved through design’s past hopefully provides useful insight for thinking about design today and to come. And I believe the readings were useful in that respect. Beginning with Gerstner, he sees a system as a means to account for a vast variety of design characteristics to be combined into a great variety of potential design outcomes. This machine-like managed process or methodological approach to designing attained an ideal of modernism — rational means to design outcomes. While Gerstner doesn’t discuss complexity, it seems implied by his system as a means to manage and utilize a “complexity” of elements to result in great variability, yet restrained, outcomes — most specifically for logotypes. What resonates for me today about Gerstner’s system of design is that it would easily convert to an actual machine-system — i.e. the computer. In fact, I mentioned at some point this semester, the Design N-Gine project that I’d come across years ago. Essentially it turned design styles into algorithms that could be applied to different forms (websites, logos, brochures, etc.) to create stylized results. But if machines repeat human “creative” labor, then who needs the humans? Venturi’s “Complexity and Contradiction in Architecture” represents an extremely significant turning point in design — the turn away from ideas like those represented in Gerstner’s rationalist notions of design as an example of the kind of approach that avoids the reality of complex and messy existence — and complicated needs. Venturi argued for design situated in REAL contexts rather than idealized ones. For one, it’s hard to imagine Gerstner’s systems applied to anything beyond logotypes. Gerstner’s is a utopic dream of design (mirroring the modernist utopic vision of tidy, controlled and rational life) and it’s this simplistic notion that Venturi — and post-modernism in general — undermines. Which leads us to Blauvelt’s “Towards a complex simplicity.” One of the reactions by the graphic design community to the ground-rattling writing of Venturi was the kind of work that Blauvelt refers to as “simply complex” — complexity for complexity’s sake (the very thing that Venturi cautions against). This simply complex work could be seen as a response to the pent-up ambitions and emotions of a community over-constrained by the stricture of rational, predictive systems like Gerstner’s. Blauvelt is concerned with the simply complex reaction of design to Venturi’s call as much as the reaction to the reaction (we could call this “simply simply”): On the one hand the implied “anything goes” of post-modern design leaves no room for critical response (because there’s nothing to measure against if EVERYTHING is acceptable). On the other hand Blauvelt is equally troubled by the back-peddling to the good ol’ days of simplicity (the Gerstner ideology more or less). The real issue remains unaddressed — finding a means of representation that goes beyond simply mirroring the complexity of existence to any sort of functional end. But I believe we are still left unsatisfied with a response by design that accounts for reality beyond representations such as complex simplicity. 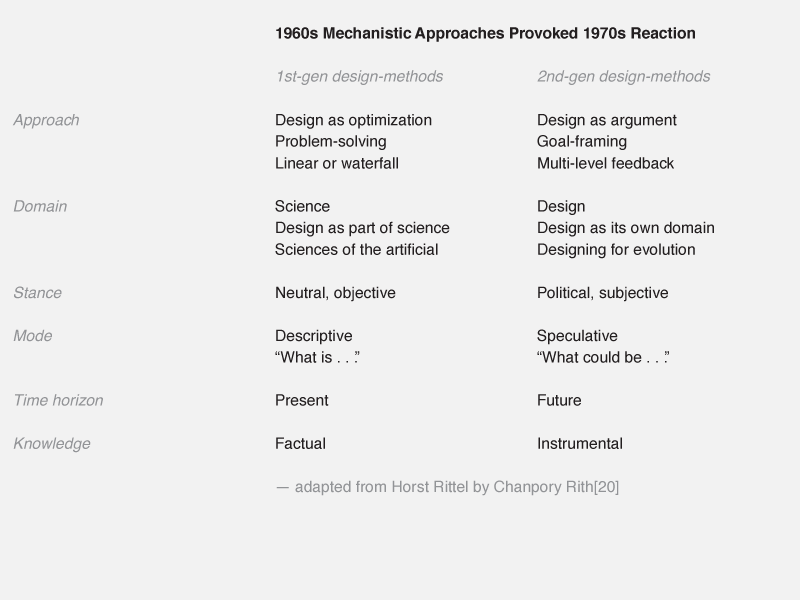 And this is where I believe Dubberly’s, “Design in the age of biology” offers a significant response for design. Dear Hugh, 3 years later, i would like to know how your perspective on “The Age of Biology in Design” has evolved? ?